Electro Discharge Machining (Spark Erosion) facilities for a range of applications to suit your metal cutting needs. Wire EDM Machining which is also known as Spark EDM is an electro thermal production process in which a thin single-strand metal wire in conjunction with de-ionized water which is used to conduct electricity allows the wire to cut through metal by the use of heat from electrical sparks. 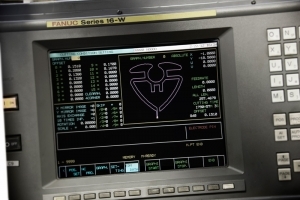 Wire EDM can easily machine complex parts and precision components out of hard conductive materials. Edm wire erosion ( continuous spark erosion or wire cut), can cut intricate contours or cavities in many types of metal including pre-hardened steel. The EDM process is suitable for cutting punches, dies and tools from hard metals that are too difficult to machine using other methods. We can cut brass, steel, stainless steel, copper, aluminium and more. The working area of our machine is 300 x 200mm with a working height up to 120mm. Low cost – great value for money. With EDM there is no direct contact between tool and part being machined. Therefore delicate sections and weak materials can be machined without any distortion.